We present an analytical model to calculate development of stress and plastic relaxation during reactive diffusion in core shell nanostructures. The complex model can be considered as a Stephenson’s model [Acta Metal 1988;36:2663] on spherical geometry. Using our derivation, however, even the original equations for the planar case may be deduced in an easier way than in the original work by Stephenson. We apply the model to the reaction in spherical triple layers A/B/A and B/A/B, for which Schmitz et al. [Acta Mater 2009;57:2673] observed by atom probe tomography that growth rate depends on the stacking order. Comparison with experimental data proves that significant deviations from vacancy equilibrium appear which control the stability and reaction rate of the nanometric diffusion couples. Reactive diffusion on the nanoscale has become very important in spherical geometry since 2004. Numerous papers on hollow nanoshell formation have been published. Metallic spheres were reacted with oxygen and sulfur to produce nanoshells of oxides or sulfides. In these reactions, the role of stresses has not been clarified, although in the case of closed geometries and large curvature they must play a significant role. Stress effects may lead to asymmetric growth of intermetallic layers in spherical triple layers. Asymmetric growth was observed by atom probe tomography in Al/Cu/Al and Cu/Al/Cu samples and was also shown that the growth rate of intermetallic products can depend significantly on the stacking order of the diffusion couples which is very probably due to stress effects. 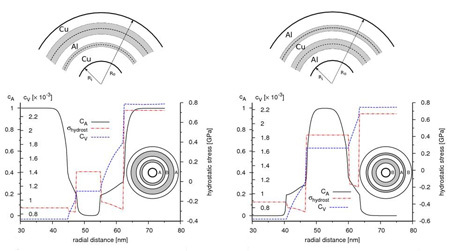 Very recently, we have developed a complete set of analytical equations to describe reactive diffusion in spherical core shell nanostructures. The model takes into account elastic stress, its plastic relaxation, as well as possible non-equilibrium vacancy densities. Furthermore, thermodynamic driving forces are included to model formation of intermetallic product phases in intermediate composition range. A new concept for describing phase formation and growth in solid state reaction was introduced. In this concept phases forms automatically as thermodynamics dictates—via chemical potential—and growth. The model was applied to the spherical triple layer problem and could explain the asymmetric growth of the intermetallic layers in details.